You’re teaching in the school already, and going for a permanent job there. Or you’re a deputy principal hoping to become principal. It can be a tricky situation – here Liam Horan of www.SliNuaCareers.com talks about selling yourself to people who already know you well. Sli Nua Careers has offices nationwide and specialise in CV preparation, application form writing, interview training , LinkedIn profiles and mock interviews. Hello Liam Horan here from Sli Nua Careers we’re a career training company with offices all around Ireland and a great deal of our work is done with teachers at all levels in the education sector. “I’m a primary school teacher fresh out of college and getting by with subbing days here and there. I’ve done two interviews and though I felt I did well in both I was unsuccessful on both occasions. Are there any general tips for teachers and should I speak Irish at any stage in the interview.” And that came by email from Mary. What I’d say first of all Mary is competition for teaching jobs is intense so it is possible you did a wonderful interview showcasing your talents and attributes. It could just be that somebody else did a better interview or had more experience than you. And all you can do in an interview is your best, and trust that one day soon, an interview you do will lead you to the position you are seeking. We tell our primary school teaching clients that it is crucial to lead everything you do to the bottom line, namely in this case, the bottom line to help young people gain a better education and to create a classroom and school environment where they can express themselves safely and securely. So if you’re telling the interviewer that you’re a good team player, go the extra mile and add that teachers must function as part of the team, only through the entire staff pulling together can we successfully carry out our job of helping young people to learn. So go that bit further always we are talking, as I said, about a team player bring it into the school environment, bring it into that school environment if you can. If you’re outlining how you’d like to get involved in training the school cross country team talk about how sports contributes to a happy environment and it allows young people to tap into talents they possess and generally it’s in creating the kind of atmosphere that is appropriate for learning and personal development. So again don’t just say it and hope that they get the second half, give them the second half as well tell them why you do what you do. Because ultimately I would argue that’s what the principal and board of management are looking for, it’s important to see the whole process from their side of the interview table. We have an interview workbook form that you can access by emailing [email protected] and that guide/workbook helps you identify what is the principal looking for, what are the board of management looking for, what examples have I got that meet those. And how can I bring this information into an interview situation. That workbook will help you a great deal in that way. And should you speak Irish? With the question you asked Mary, why not. Part of your role will probably be to teach Irish, I think that’s implicit in the way you ask the question, so what better way of showing your proficiency by actually rolling out a cupla focal. I wouldn’t do it for too long in case somebody else in the panel hasn’t got that much Irish and prolonged use of the cupla focal, which would no longer be a couple of phrases, and of course might alienate them. But it could be a very nice little touch for a little bit of the interview and move back into English which is the language of the interview in all likelihood. You know that’ll be my advice on that and so I hope those tips help you Mary. Really what you’ve got to do is apply your experience to date to the bottom line of the school to make teaching better, to make the environment better and not just to imply it but to be very explicit. Tell them, tell them, tell them. If you don’t tell them presume they don’t know. Even though it might be on your CV or application form tell them again in interview because the interview must stand alone. You can’t be sure that the interview panel has even read your application form or your CV. One of them may have or perhaps none of them have or indeed perhaps all of them have but don’t leave it to chance. So you should tell them what you want them to know in the body of the interview. As I said email [email protected] for our interview training workbook or check our website there for our offices around the country. 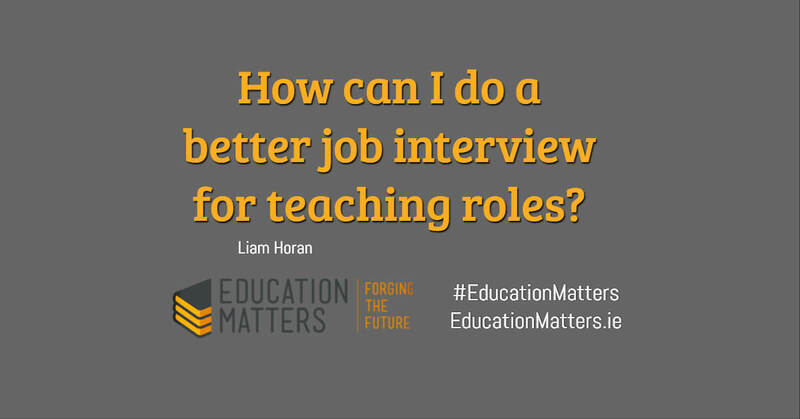 And if anybody has any question they’d like to put to us for future iterations of this podcast please email that address as well with your question and just mark it for EducationMatters.ie thank you very much and best of luck in your career development. Looking for more great career tips from Liam? 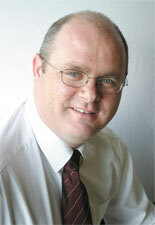 Check out his piece on “How to tackle the Assistant Principal application form“.